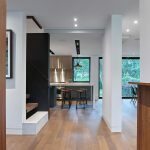 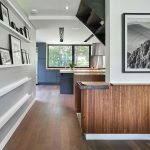 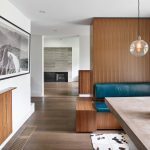 A 1950s Toronto home has been renovated to create a luminous space with dark smoked, white oiled Sumo planks that flow through the ground floor’s open rooms. 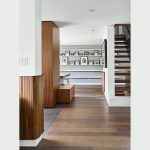 The oil finish spans a wide colour range and unites the details that define each room without feeling busy, and the woodwork of the paneled walnut guards brings warmth to the room in harmony with the floor. 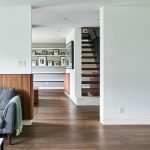 Straight run, glue down over subfloor.